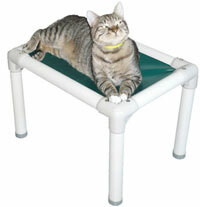 What is a Kuranda Bed? Just imagine lying on a cold, hard, concrete floor 24 hours a day. Add the stress of an unfamiliar place with sights and sounds feeling nothing like home, and you can understand the stress a dog feels in an animal shelter. Your donation of a comfortable raised bed will provide a soft and dry place for a dog to have a good night's sleep. 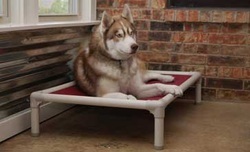 Beds are offered at special discount , come with a 1 year warranty and are sent directly to the shelter in your name. Please click the link and donate a bed so another of our dogs can have a soft place to relax. A shelter dog will be grateful! Thanks to your generous donations, we now have PLENTY large dog beds! Please consider donating cat/small beds. We will purchase the beds on your behalf!